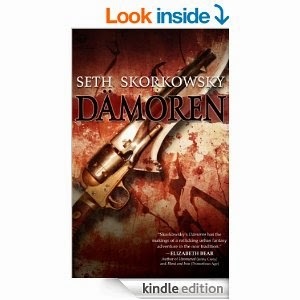 Damoren (Valducan) written by Seth Skorkowsky. This urban fantasy novel immediately caught my interest from the striking cover. And after reading the description, it didn't feel like the typical urban fantasy stories you see nowadays flooding book shelves. The book follows Matt Hollis. As a young child he witnessed his family being slaughtered by a Wendigo and during the attack he got bitten by the monster. As a result he became infected by it and soon discovered that he could heal himself miraculously by touching demon blood. Now as a grown man, he travels around hunting monsters (think Dean and Sam from Supernatural). However, his escapades soon don't go unnoticed as a secret organisation of knights who also like to kill monsters want to meet him. The book jumped straight into the action and I was instantly drawn into the story. The writing was very purposeful in that not a single sentence felt wasted. Also the dialogue was crisp and smooth. The plot was was fast paced, although it did linger near the middle before picking up near the end. One of the major reasons why I enjoyed this book so much was the fantastic scary scenes written by the author in which I could actually feel a chill whilst reading the passages. This is how a proper Urban Fantasy should be. Supernatural beings here are evil monsters and not ones you want to cuddle up to at night. Another attractive feature of the book was the idea that holy weapons are the only things capable of killing demons. These weapons can be anything, ranging from a sword to a gun and they bond to their wielders forming an almost conscious connection. It was really interesting seeing that concept play out and where the author would take it. And it does become a key feature near the end. By the way, I forgot to mention, the main character, Matt, special weapon was a gun called Damoren. As far as characterisation goes, I have no real complaints. Matt is your typical stoic, unflinching, selfless main guy. And as a reader you can't help but like him. However, I did feel that he became slightly overshadowed by the other characters, and at times I was left wondering who the main protagonist was. There was some holes in the storyline where I believed something was true and then finding out some point later on it's not. Maybe it's just me and not reading it properly. The ending kind of left me speechless and mouth agape. And not, altogether, in a good way. Near the end the story dramatically changed its course without any hint of forewarning and it was like suddenly all hell broke loose. Having finished the book, scratching my head, I had to go back to the last few chapters just to try and comprehend what happened. And even after my second re-read, I still wasn't 100% certain what occurred. Despite the confusing finale, I had a great time reading this book. The action scenes had me breathless and the eerie scenes had me almost cowering in fear. Seth Skorkowsky is an author I'll definitely be keeping an eye on, and I hope in the future he tries his hands on horror, because he has real talent in evoking feelings of dread in his readers. For fans who want to see vampires and demons actually behave... you know, like evil monsters then I highly recommend this book. One of the best urban fantasy books I've read for sometime. Just a word of caution; there's a lot of gore, violence and death, so maybe not one for kids - unless your called Damien.